My wife, who does network operations here in South Carolina at a huge school district, calls this "Bring Your Own Virus". But the big question in this extremely poor area is where will they be getting these devices from? Very few students have the money to buy a tablet. That leaves you and me -- taxpayers. And my wife, ever the realist, pointed out that (more than likely) a thriving system of stolen tablets will soon spring up. I'm dead against the large scale purchase of tablets for schools see "Too cool for school: 7 reasons why tablets should NOT be used in education" http://bit.ly/YQkGXv In the UK we have a relatively high level of device ownership among pupils. In terms of the bottom line, I think BYOD topped up with support for poorer students is the way forward. Thanks for your article, it's agood summary of the attention areas for the debate around BYOD. I'm a parent of a kid at local primary school, that currently has a netbook lease program for senior students - I plan to make a pitch to school council to evolve that program into BYOD program (enhanced by use of cross platform (or cloud) open source software tools), but one of the greatest challenges I think I see is the reluctance of educators to embrace the culture of varied technology. They seem to freak out at the thought of teaching across different platforms. Personally I think that it enhances the focus on teaching concepts and generic approaches, rather than point and click lessons, but DOES require teachers to be technically confident. But I think a large majority of primary teachers are not "tech savvy" and are intimidated by the variance in technologies that BYOD would bring to the classroom. I'd be interested in how schools have addressed curriculum development in a BYOD environment? Thanks Jason. Teaching is a top down activity and to be fair teachers do have to maintain some degree of control over students and their classrooms. However,many of their fears around tech are, as you state, a bit irrational. On the curriculum, if they look at what they want to teach and select online resources and tools that are generally we-based, they should have no problem. This is the problem with the current vogue for APPS - it locks you into one system or another. The web has more than enough resources for good content without these lock-ins. Good luck with you efforts. I hope my arguments can be used as grist for the mill. Excellent post. Point 2 stands out as I find most often it is 'considered' riskier going BYOD way. In the classroom, guided by the teacher, students could explore topics in greater detail and that's very powerful for learning. For me, the biggest problem with BYODS is to ensure that online University services and learning resources are accessible from any device (i.e cross-platform). This cannot always be the case. For instance, there is a huge bank of educational resources that have been developed in Flash. Anyone using an IPad will not be able to access these resources as Flash is not supported. My institution does not have the time and resources to convert all our in-house resources into HTML5. However, our students can always fall-back on our University's IT facilities to access these resources. Similarly, some of the technologies we subscribe to take time to catch-up with the rapidly changing world of IT. For instance, our VLE (from a commercial provider) has only now introduced option of Mobile-compatible quizzes and its still limited to a few question types compared to the desktop version. These are reasonable thoughts and need addressing. First, I'm not so sure that iPads are such a popular choice among students. In my experience netbooks and laptops are far more common, for reasons I outlines in another post (see my recent post on tablets). In any case, rather than spending huge sums of new hardware and software you can help those with iPads use workarounds for Flash on iPads - there are browsers and other solutions that allow Flash to be played on iPads. Most students, I guess, would know this and how to get it done. The second point is more serious, but even them most students have notebooks or laptops, so the VLE is not a problem. In Universities I am not suggesting that BYOB means all mobiles. 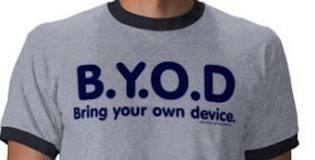 In fact, I suspect that most Universities already have a BYOB behaviour and that a reasonable analysis would show that your limited IT spend would be better spent on supporting owned BYOB kit than spending and maintaining large numbers of new devices. Hoep this helps - you raised a couple of good points. Thanks for putting this together, Donald. While some may argue if BYOD is really worth it, an important realization here is that it's today's reality. Then again, accountability and responsible use should be upheld. This 'reality' argument is key. Buying truckloads of tablets and laptops is, in my opinion, a thing of the past. Unfortunately, schooling is still very much a command and control culture (at any cost).